ps.have you seen the new fall/thanksgiving bundles? Again, I skipped and hopped through a month without logging my goals--poor August. But, I was busy with family, fun, and travel, so it really wasn't the best time to carve out super intentional goals when I was gone for two weeks out of the month. However, if I peek back to July, it looks like I actually completed all my goals--so that's fun! 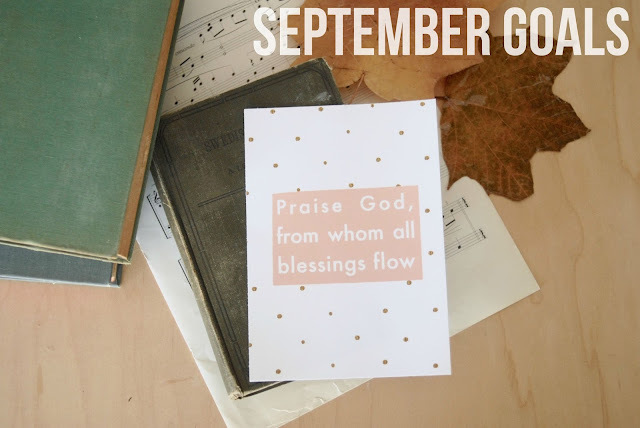 Can I just tell you that I am so happy to see September? It feels fresh and like the long haul of a Texas summer has passed. It's still hot--but I think we've seen the worst of it. Plus, it also means that routines and rhythms are re-entering life, and I'm so thankful (and ready!) for those to return. Bring back some heart on the blog. Recently, most of my blog posts have been about general life, the shop, or random stuff. I like having that as a part of my blog, but I also like to dig deeper and write rawer. So, this month, I want to blog about some topics/thoughts that have been on my heart and mind lately. Keep up with my cleaning schedule. Writing down a daily chore/house stuff schedule has really helped me stay on task--I want to keep it up, but also to feel the freedom to change it if something isn't working. I'd love to hear your thoughts on ways that you keep your house tidy and relatively clean--share your secrets! That's it! We actually have quite a busy month, so I know it's best not to fill it with lots of extra tasks and projects. How about you? What are your goals for September?